Consumers' insatiable appetite for localized filmed and TV entertainment has led to enormous challenges for producers and distributors alike to deliver huge volumes of content. At ZOO Digital we believe the answer lies in the Cloud and have created ZOOcore - a platform that can transform creative and production process management. It seems that only a few years ago, when it came to distribution of film and TV content in the home entertainment industry, DVD was the only game in town. Today, the array of device, format and media choices available to consumers is staggering. This, coupled with consumers' insatiable appetite for localized filmed and TV entertainment around the world has led to enormous challenges for content producers and distributors alike. These stem primarily from the demands of delivering huge volumes of digital entertainment in today's markets. When you consider that this transition has taken place to a backdrop of a challenging economic climate it is no wonder that companies throughout the industry are under extreme pressure to cut costs and improve efficiencies. There can be no doubt that this change has been brought about by astonishing advances in technology, which includes the meteoric rise of cloud computing. Although they may not realize it, 95% of consumers have come to depend heavily on cloud-based services in areas such as digital locker services like UltraViolet, social networking and email. 2nd Cloud Circle Industry Trends. 250 UK IT-based executives interviewed Sept-Nov 2011. Now more and more creative and production companies are turning to the cloud to help increase productivity and reduce costs. 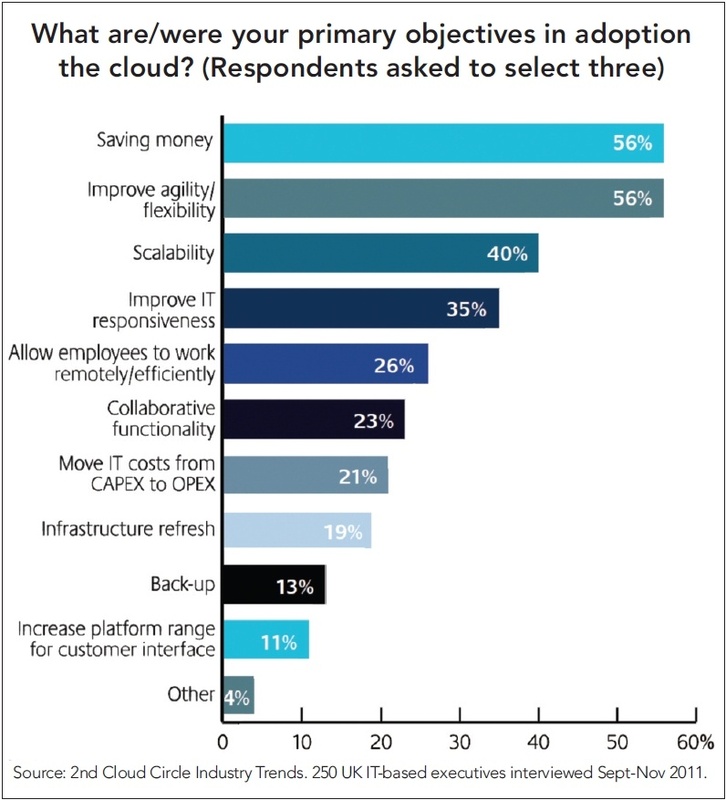 According to the 2nd Cloud Circle Industry Trends Survey of senior business, finance and IT-based personnel, saving money and improving agility/flexibility are the two most common reasons for adopting the cloud. Measurable: there's metering/reporting so you know you are getting what you pay for. What makes cloud services so attractive to many businesses is the way that they are charged - customers pay only for what they use, when they use it. This makes cloud services much more cost-effective than traditional approaches to computing and is allowing many organizations to become more competitive, profitable and agile. With so much to gain, why then, on the whole, have media organizations been relatively slow to embrace cloud services? There are a number of reasons. Ironically, one of the biggest is that businesses are so busy doing what they know best and fighting fires that there's no time left in the day to step back and see what benefits new approaches can bring. In an effort to make their workforce more efficient, businesses may choose to install new information systems. However, a common pitfall is that new systems usually bring new working practices and procedures which take time to learn. As a result, productivity can actually go down rather than up when a new system is rolled out. If operators are under pressure then introducing new systems can easily backfire if not done right. Before we explore how media companies can tackle this dilemma, let's take a look at how and why cloud-based platforms are beginning to take hold as an alternative to the conventional approach. Traditionally, a business hires an IT team to build and run its computer systems. This means spending cash up-front on servers and software. Once those systems are up and running the IT team will make sure they continue to be so, which includes continually updating software and computer security. So, there's a significant capital cost and an on-going cost of a dedicated IT team. Contrast this with systems hosted in the cloud. Businesses no longer need to purchase, install, host and maintain their own hardware: servers can be 'rented' - by the hour, if needed - so that start-up costs require almost zero cash. Starting up a new service, or increasing capacity to deal with a peak requirement, such as a big transcoding job, can be activated in moments and charged on a pay-as-you-go basis. This means that businesses pay only for the infrastructure they need, when they need it. The business model that has proven to be most popular is Software-as-a-Service, or SaaS, where software developers make available a complete package of certain functionality that customers can tap into as and when required, scaling resources up and down as needs dictate. Under a SaaS arrangement the service provider takes care of all those tedious maintenance tasks, such as bug fixes and computer security updates. SaaS solutions are usually designed to be resilient, which means that in the event of, say, hardware or network failure, customer services are uninterrupted. Under an arrangement like this there is usually no significant requirement for traditional IT management at the customer site at all - maintenance and user support are provided directly by the SaaS company. Consequently, the cloud democratizes IT - it allows any business or workgroup of any size to access the kind of services that were previously accessible only to the largest enterprises. The implications of these benefits to the broadcast industry were highlighted in a recent conference on the cloud hosted by the IBC. Opening the event, Bob Harris, CTO with Channel 4 Television in the UK, explained how his investigations into cloud computing began in 2008. His team developed web applications to support two E4 TV series. The ability to automatically scale up the cloud-based computing resources to respond dynamically to consumer demand as viewers switched on to the applications during commercial breaks enabled Channel 4 to deploy a robust, scalable solution at minimal cost. Harris explained how there are many misconceptions surrounding the cloud, which should be dispelled as Channel 4's cloud model is proven to be secure, reliable and scalable on account of its three most fundamental features: self-service, pay-as-you-go pricing and 'elastic computing.' The latter refers to the capability of cloud systems to dynamically increase or decrease ?resources in order to maintain a consistent level of service irrespective of the demands that are being placed by users. Many businesses are reluctant to adopt the cloud due to security concerns, but Harris explained that cloud security today is designed to meet the most demanding requirements of corporate IT departments, including his own. Other industry speakers at this conference described a range of applications that are proving valuable and cost effective. These include video transcoding (the encoding of video streams to support the wide range of formats now required for digital delivery across multiple distributors), where solutions such as Amazon Elastic Transcoder and Microsoft Azure Media Services are proving popular. File transfer solutions, such as Aspera and Signiant, designed for moving very large data sets (such as video materials) between content originators, post production facilities and distributors are being delivered using cloud infrastructure. Applications that have been delivered traditionally on the desktop are also moving to the cloud, including the controversial Adobe Creative Cloud which makes the erstwhile Creative Suite toolset available on a SaaS licensing model. There has been an increasing trend amongst organizations throughout the digital media and entertainment industries to make greater use of automation as a means to improve operational efficiency. Coupled with the move to centralizing operations, the cloud is proving to be an effective way to support enterprise video workflows. Considerable efficiencies can be delivered when automation and centralized operations are employed for distribution and playout. The unifying characteristic across all of these areas is workflow; many of the challenges faced by businesses today concern the management of workflows. According to the dictionary, a workflow is "the sequence of industrial, administrative, or other processes through which a piece of work passes from initiation to completion." I'll use the term to refer to all of the things that a business (and its partners) has to do in order to provide a certain service or to develop a type of product. In most aspects of creative media production, wherever this occurs within the industry, the efforts of multiple individuals must be co-ordinated to deliver the outputs that meet client requirements, within budget, timescale and to quality standards. The commercial success of many businesses today is directly linked to how efficiently these workflows are operated. Consequently, management of workflows is increasingly a strategic capability. Let's look at an example to explore the importance of efficient workflow management in businesses today. Consider a small marketing agency engaged by a film studio to create advertising materials for a forthcoming feature across a number of territories. Creative concepts must be circulated for review by multiple managers throughout the client's organization; text must be translated; localized artwork must be checked by native speakers; various iterations of multiple items will be produced and versions must be controlled meticulously. Managing such a process to tight deadlines can be onerous and vulnerable to human error. If this sounds to you like project management, then let's be clear about how the efficient management of workflows and projects differ. Project management is normally applied to one-off undertakings, which are probably unlikely to be repeated, such as the installation of new equipment. In contrast, workflow refers to activities that are performed repeatedly, to deal with a business area that is undertaken time-and-time again, usually a routine part of a business' remit (e.g. creating advertising materials). The reason to make this distinction is that operating workflows occupy the majority of the time of most businesses, and there is usually an excellent opportunity to systematize workflows through the judicious use of IT in order to dramatically improve repeatability, consistency and quality. What we have found is that most media businesses use very simple tools to help them manage even complex workflows, usually Microsoft Excel and email. This can work fine up to a point, but as the number of simultaneous jobs increases it becomes onerous and error prone. In practice it limits the number of jobs each project co-ordinator can reliably handle, which means that administrative overheads are high. ZOO has worked with a wide range of media groups and we typically find that, with the support of the right software, project co-ordinators can at least double their throughput. Or, put another way, administrative overheads can be reduced by at least half. So, here's the dilemma: how can a business make the changes necessary to deliver these kinds of savings without disrupting day-to-day operations? We have learned that the answer lies not in making staff learn new workflows, but rather in providing systems that proactively support the existing workflows. In other words, businesses continue to capitalize on the procedures that have already been proven to be successful, but draw on computer systems to automate their administration. A new generation of workflow management solutions is being enabled by the power of cloud computing. Businesses involved in many aspects of digital media production and distribution are turning to cloud workflow management to allow established and proven working practices to be performed much more efficiently. By using flexible, configurable platforms, bespoke systems can be assembled very quickly and inexpensively, optimized for the specific characteristics of the target business environment. The implementation can be tweaked and adjusted over time to ensure that it continues to meet the evolving needs of the business.